A collar of a button down shirt poking out from a sweater will never go out of style, and this J. Crew sweater makes it even easier to rock that style. With the collar attached to the sweater, there's no risk of awkward lumps or weird lines from layering two shirts. 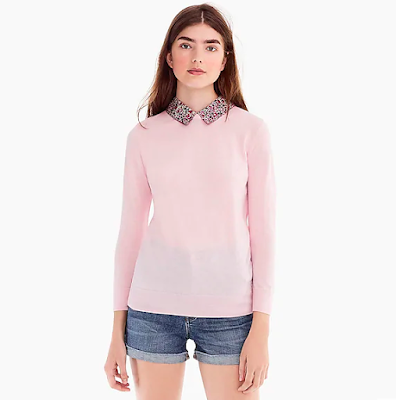 The floral collar is gorgeous and adds the perfect sophisticated touch to an otherwise simple pink sweater. This top is a beautiful feminine take on a classic office appropriate top. The button down and collar make it appropriate for any professional environment, and the polka dots and bow add a touch of fun. I love Brooks Brothers button downs, they always fit so well, and this top would look great with black slim work pants with black pumps, or tucked in to a gray pencil skirt. It's not too stuffy, so it can easily be worn to a happy hour after work. Espadrilles are a summer staple. They're the perfect way to wear close toed shoes in the summer without getting too hot. I love these as a pair of statement espadrilles. The floral pattern is so playful and bright, but the indigo base for the pattern and the navy toe make it so these shoes can be worn with a variety of outfits. They neutralize the fun print a bit. These would be great vacation shoes if you're going somewhere with lots of walking. You can never have too many Little Black Dresses, and I love this more casual version that Tuckernuck has right now. The short sleeves and the flouncy hem make it the perfect dress to wear to the beach or out to a nice wine bar at night. It can be paired with a cute pair of sneaker for a more casual look, or with a fun colored pair of heels and statement earrings for a dressed up date night look. It's such a versatile and classic dress that can be accessorized so many different ways. 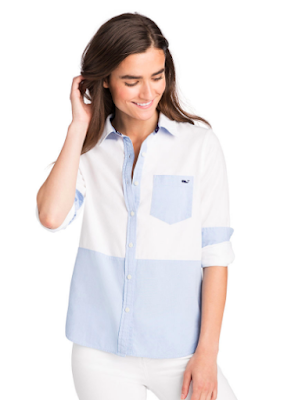 I love a classic oxford shirt in the fall, and this is such a cute update to a timeless piece. Blue and white are my go to oxford colors, so I love this colorblock. The blue pocket really pops against the white top of the shirt. I would wear this to brunch with white pants or dark skinny jeans, or to the office with a khaki pencil skirt. This is the kind of shirt that you can wear for years to come.